In the late nineties, scores of deeply average guitar bands lamely attempted to bore the public into submission, selling millions of bland records to thousands of men desperate for something slightly more interesting than their wives’ Dido albums. This wave of musical inertia is wholly responsible for the success of the Stereophonics. Amidst this sea of mediocrity, Sunhouse drowned. Despite the patronage of up-and-coming film director Shane Meadows (whatever happened to him?) who used their songs in two of his films and Sinead O’Connor, who provided backing vocals for the album, the Nottingham outfit sank without trace. 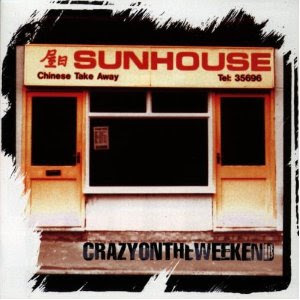 Their only album, Crazy On The Weekend, is now almost fifteen years old and i still listen to it very regularly: it would certainly make my all time top ten. Characterised by singer/songwriter Gavin Clark’s distinctive whisky and fags voice, it’s a rootsy/bluesy record reminiscent of John Martyn or Paul Weller at his best. The songs are powerful but fragile – and deeply emotional. Lyrically, the album explores love, loss and death but is never maudlin or depressing – with occasional sonic blasts from tracks like Hurricane demonstrating Sunhouse’s raw power. But it’s on gentle acoustic tracks where the band are really at their best: Lips is one of the finest and most beautiful love songs ever written. Album reviews are really not my forte and i’m not sure this one does Crazy On The Weekend justice. So my advice is this: get yourself a copy. Buying it will be nigh on impossible as it’s been deleted now – but i’m sure it’ll be possible to download it somewhere. You won’t regret it.